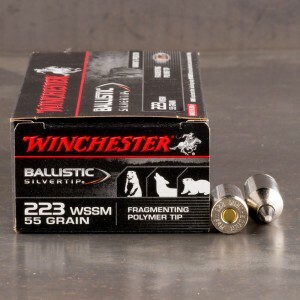 The 223 Winchester Super Short Magnum, or the 223 WSSM, was brought to the market with it’s bigger brother the .243 Winchester Super Short Magnum in 2003. The round was produced to show off the ability of modern ballistics and to inspire shooters interests in modern ballistic performance. The round was met with controversy immediately due to the rounds speed and power shortening the barrel life on rifles. 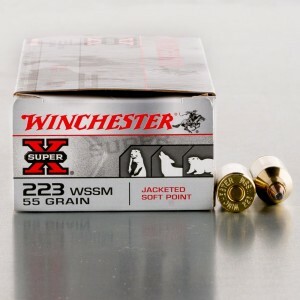 223 Winchester Super Short Magnum ammo is the fastest production 22 caliber round in the world. The round reaches muzzle velocities of 4,600 feet per second, also known as Mach 4.1. This speed presents an extremely accurate round that is an excellent long distance varmint cartridge or as a small caliber precision rifle cartridge. The cartridge was so short a new action had to be developed for it. Winchester refers to it as the super short action on their rifles. Great service an fast delivery can't find this any where in Pa where I live will buy again when I need more. My order arrived in just 6 days was very happy with service an packaging.Will buy again when I need more ammo because I can't find it anywhere in central Pa.